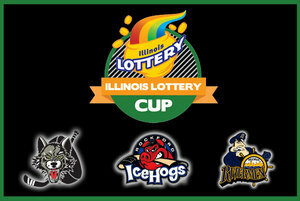 Rockford, Ill.- The Rockford IceHogs, in conjunction with the Illinois Lottery, announced that they will battle the Chicago Wolves and Peoria Rivermen for the Illinois Lottery Cup during the upcoming 2011-12 American Hockey League regular season. With the IceHogs slated to battle Chicago and Peoria 12 times each and Peoria and Chicago facing off 10 times head-to-head, the team with the best winning percentage against their in-state rivals at the conclusion of the 2011-12 regular season will claim the Illinois Lottery Cup. The Illinois Lottery Cup will be on display throughout the season at select IceHogs home games at the BMO Harris Bank Center. The Illinois Lottery Cup will make its first visit to Rockford at Tuesday’s exclusive season ticket holder “Meet The Team” event at the Radisson Hotel. The Illinois Lottery has partnered with the IceHogs, Wolves and Rivermen to sponsor the rivalry cup and other in-game elements with each team. The Illinois Lottery is sponsoring the IceHogs second intermission scoring recap during all 80 regular season broadcasts and all additional postseason broadcasts on the IceHogs Broadcasting Network. The winner of the Illinois Lottery Cup will be awarded the “Pot-of-Gold” at a game at the end of the 2011-12 regular season. Customizable rivalry ticket packages are available to catch the IceHogs in action against the Wolves and Rivermen by calling (815) 847-6399. Founded in 1974, the Illinois Lottery has contributed $16.4 billion to the state Common School Fund, as well as the Capital Fund. The Illinois Lottery is now managed by Northstar Lottery Group, a fully integrated consortium of best-in-class companies with over 50 years of combined experience in Illinois. Northstar will responsibly drive Illinois Lottery growth and returns to benefit Illinois residents. Players must be at least 18 years old. Next Home Game: Saturday, Oct. 8: The IceHogs open the 2011-12 season against the Grand Rapids Griffins at 7:05 p.m. at the BMO Harris Bank Center. Every fan in attendance will get an IceHogs 2011-12 magnet schedule. For tickets call (815) 968-5222 or visit icehogs.com.